Lily starts kindergarten in a week! 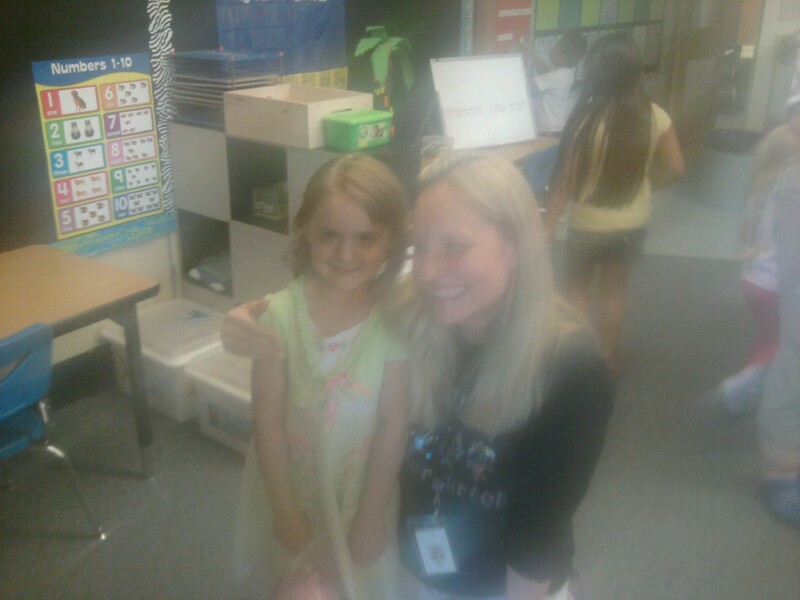 Last night we all took a trip to the local elementary school to see her classroom and meet her teacher. We found her seat and this classroom has a small community set up for the seating. Rather than the tiny little desks I expected, they instead have tiny little tables with tiny little chairs and each table seats four tiny little students. The students are situated two to a side, so Lily will have someone next to her and two people across from her. Her closest deskmate is Henry. Henry is a fine, upstanding farmboy working the fields in Nebraska. I’m not sure who Henry is in Vancouver. I’m going to picture him as a polite, clever young man who will be sweet to my daughter. We were asked to fill out a Q&A sheet about Lily for the teacher. One question really gave me pause: What do I hope for Lily to gain from this school year? Interestingly, Tara and I have talked about this a lot. Lily is overly bright. She started reading at four, can spell more words than her 8-year-old brother, can count money (and understands the difference between a nickel and a quarter, not something your average 5-year-old gets), can do basic math, has great hand-eye coordination, is socially advanced… In other words, we think she’s damn close to perfect. Our hope for the school year doesn’t revolve around what we hope she will learn (part of the kindergarten curriculum is to teach ABC’s for goodness sakes), but rather we’re concerned about what she’ll forget. Our education system is set up to function as free daycare, which is great if you are in need of free daycare. But in terms of an educational model, it really struggles. And how could it not? It’s underfunded and the teachers are drastically over tasked. We’ve been lucky and had some great teachers for all our many children, but every single one has been overworked to the point where they simply cannot keep track of all the details. Nobody could. My point? I have great respect for educators. They have a difficult job and I am impressed by their dedication. Still, it is a broken system. So, what do we hope for a gifted child in a school system that by design culls out greatness and molds mediocrity? We hope that she doesn’t lose that sharpness. We hope she doesn’t lose her edge. She’s currently well above level and we really, really hope that continues. Her older brother, Wyatt, is eight and entering 3rd grade. He has Aspergers (that’s high functioning Autism) and can be quite a handful. We’ve struggled through three years of public school. What do you do with a child who is off the charts brilliant in some areas, but has the social skills of a tempermental baby badger? I cannot count the number of times he was sent to the principal’s office last year. This year we’re trying something new. Evergreen school district has a program called Homelink. He’ll attend classes twice a week for a couple hours, but the rest of the time, he’ll be learning at home in a computer based environment. They provide the curriculum and all the materials–there is a 27 pound box on its way to my house via UPS right now–and they take care of the standardized testing required by the state. Tara and I struggled with this decision quite a bit. I don’t honestly think that we are better qualified than a team of trained professionals to teach our son. However, I’m certain that we love him more. Odds are higher that we will focus and insist that he complete the work rather than just throwing our hands up and settling for less work in favor of him not being disruptive. And again, who can blame a teacher for taking that approach? He’s a DIFFICULT student in a room full of other students who need her attention also. Last year we were in contact with the school very regularly. His teacher and I were constant penpals via email. Still, I found out from Wyatt about two weeks before school was over that his teacher had moved his desk away from the other students months before. I was sooooo upset. Isolating a child, putting him in the equivalent of a permanent time out, is a DRASTIC move. I felt betrayed. We emailed regularly. Why was I not notified of this move before it was made? Wyatt, however, thought it was a reward. He was very happy sitting off by himself without the pressure of interacting with other students. He wasn’t very happy when I contacted the teacher (and the principal) and insisted that this was not the appropriate way to deal with a child. Our job, mine as a parent and hers as a teacher, is to teach him the skills he needs to be successful in life. If he struggles socially, should we isolate him and ignore the problem, or should we educate him on how to be a better student, a better group participant? Now I’m not sure that my strong stance on the matter was the right approach to take. Wyatt has a diagnosed medical issue. He’s not just being unruly or difficult. He has better anger management skills than most adults I know. He has great tools. He just has a greater need to use them on a regular basis. If the average person runs about 50, giving him a lot of room before exploding, Wyatt runs at a constant 90-95. He wants to be in control. He tries like hell to be in control. Sometimes, he just overflows. Knowing that it’s a real condition, not just an out-of-control kid–I’ve seen both; it’s easy to tell the difference–is it the best thing to force him into a situation that triggers his outbursts? Situations that push him over the edge? He copes just fine with one-on-one interactions. He’s very polite, says Hello, nice to meet you. He’s socially fine until he’s placed into a situation with too much stimulation. I could say the same thing about myself. I hate being in buildings with too many bright lights; Vegas is not a fun escape. There are even warning labels on strobe lights about how they can cause seizures. If I, as a parent, took a kid who was prone to seizures and dropped him in the middle of a lazer light show, that would be considered bad parenting. Yet, I kept forcing Wyatt into a setting that triggered him in much the same way. I’m not going to go into details about what it looks like when a kid with Asperger’s hits breaking point, but it’s NOT pretty. It’s heart breaking. And here I was forcing him into social situations that I thought would teach him how to function better in life. Let’s face it, school is difficult for a ‘normal’ child. Kids can be downright cruel to one another. The tease, they push, they are mean, they ostracise. Combine that with a kid that self-isolates as a method of self-preservation and you end up with a frustrated boy taking daily trips to see the principal. The best analogy I can come up with is that if you have a kid who is allergic to strawberries, do you force feed him strawberries so he can learn to live with the rash or do you keep him as far away from strawberries as possible? In an effort to keep him away from the strawberries, we signed him up for homelink. I hope we are up to the challenge. And I hope that Lily will get every experience from public school that Wyatt couldn’t possibly enjoy. As a special ed teacher I have a lot of autistic children. In Utah we have more than the national average per population. You are right to expect more from the educational teacher and administration. It’s important for these students to be among other students and taught appropriate strategies in dealing with various difference. Asperger children are highly functional and can be taught these strategies. They need to be able to practice these skills at home and in public. He does very well in social settings. But he doesn’t cope well with being teased or prodded. Lots of teasing and prodding happens during the normal course of a school day. Wyatt was on an IEP for a while and he used it as an excuse to not do the academic work. The program he was set up so that he was in a regular classroom, but went to the resource room when he was having a difficult time. He learned far too quickly how to use that to his advantage. He wasn’t being challenged academically, so he was bored and was quickly cast in the role of class trouble maker. At the end of kindergarten they did academic tests on him (that were required because of the IEP) and he was at a second grade level in most areas except writing. Boy hates to write. We’re not sure if it’s the texture of the paper that bothers him or simply that he is a perfectionist and he can’t write perfectly yet so he doesn’t like to do it. When they got the results of his academic testing back that year, the staff’s collective response was “We had no idea he was so smart.” It was very, very frustrating. And I must stress that I have HUGE respect for teachers. Y’all do some amazing things. The system as is just is not a place where we feel Wyatt will find success. So we are trying something different. It may be a huge fail, but we’re going to try like hell to make sure it’s not.